Throughout his law career, many of Johnny N. Garza Jr.’s decisions have been guided by one simple passion: a desire to help others. Garza has the opportunity to do just that as a partner at Adame | Garza, a Houston-based law firm that represents people suffering from personal injuries. Garza’s helping hand, however, reaches beyond the walls of law offices and courtrooms as he serves on the boards of a number of legal and civic organizations. 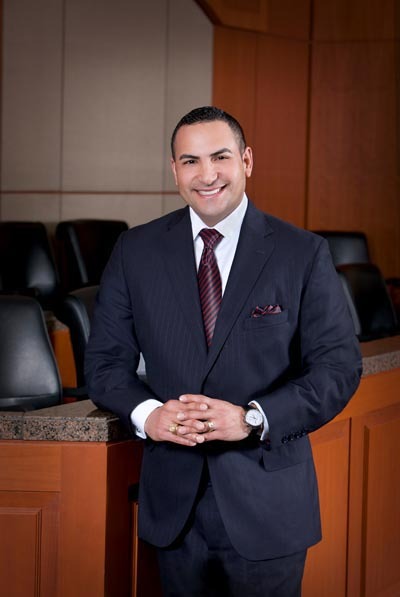 In January 2013, Garza was named one of this year’s Top Lawyers Under 40 by the Hispanic National Bar Association. He has received these awards not just for his successful law career, but also for his efforts to give back to his community. Being a hard worker and thinking outside the box. My definition of integrity is that you actually care about what you do. Latinos are a rising force within the United States, but we must continue to give back with our time, wallets, and mentorships to ensure the next generation further success. Upon graduating law school, I began my career in 2002 at Royston Rayzor defending Fortune 500 companies (in cases regarding issues such as personal injury, insurance coverage, securities fraud, and more). I believe the key to my success was really getting to know my clients and their business. It was about making that extra phone call and making the extra visit to further understand the different perspectives regarding the business. I spent time talking to many employees from different departments while I conducted a thorough investigation. I made it a priority to comprehensively understand the clients’ needs and to fully grasp their business operations. What I learned about myself when I was working at Royston Rayzor was to trust my instincts. I greatly enjoyed that my mentors at Royston Rayzor allowed me to work independently. They would say, “We hired you for a reason, so go out and apply common sense and what you learned of the law. Think on your feet and put all that together to make a decision to help your client.” This experience helped me gain confidence in my practice. Even though I was a young lawyer, only 24 years old, I believed I had what it took to be successful. Towards the end of my career at Royston Rayzor, there were many occasions where I was defending companies that were being sued by Latino males who were injured during a work incident at a construction or plant site. Those Latinos were usually the sole providers for their families so each injury affected several people. These experiences motivated me to change the direction of my practice and I went to work for the oldest plaintiff’s firm in Houston in 2006. The first lesson that I learned on the plaintiff’s side of the law is that the burden to fight for your client is very personal and consequential. You have to roll up your sleeves and go above and beyond your call of duty because families are completely dependent on you to help them through immensely tough situations. When you work hard, you are prepared, and when you’re prepared, you’re always thinking a few steps ahead. These elements are essential in providing the best representation for your clients and their families. At the end of the day, I take pride in looking my clients in the eyes with the satisfaction that I gave their case my all. Working with Miguel Adame was a very unique opportunity. I met Miguel while we were undergraduate students. We became reacquainted on a flight and discovered that we were both on similar sides of the law. Very soon after, we developed a business relationship and immediately recognized that we had similar ideas and goals. At the end of 2011, Miguel invited me to join his firm and to start his litigation department. The addition of the litigation department allows us to provide a wider range of services to our clients, which are most often from Latino backgrounds. We are both bilingual so Spanish-speaking clients have the benefit of knowing they can speak directly to us without a third party. In early 2013, the firm name was changed to Adame | Garza. Currently, I’m on the board for Career and Recovery Services. The goal of the organization is to help individuals overcome barriers to employment. We serve a very diverse population with a variety of trainings, resources, and interventions that are meant to help our clients obtain meaningful employment. The programs help them develop skills and confidence to succeed on their own. It is very fulfilling to serve an organization that is doing such great work in our community. When I was president of the Hispanic Bar Association of Houston in 2011 my goal was to increase the number of scholarships awarded to deserving law students. We raised a record amount of contributions and were able to award more law student scholarships for 2011 and 2012. As a first year law school student in 1999, I was generously awarded one of these scholarships, which helped me buy books and a computer. This was a huge help to me at the time and I felt a responsibility to share that experience with as many students possible. I also work with the Hispanic National Bar Association’s Law Week Committee. This is a wonderful experience because we work directly with elementary school students and teach them about the law and the three levels of government. We explain that the three levels of government are meant to provide checks and balances, which in turn protect their rights. The opportunity to reach these students at such a young age allows them an early understanding of our legal system and their role within that system. When you want to give back you make it a priority. It’s just like anything else. You make time for your family. You make time to stay healthy. And, so, you make time to give back.